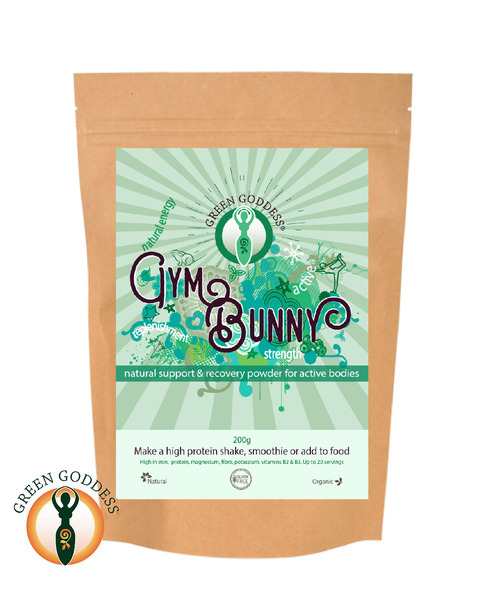 Gym Bunny is high in protein, perfect for active bodies that require support and recovery. Hand blended plant proteins for muscle growth and maintenance. Matcha, maca, lucuma and raw banana powder complete this natural, nourishing mix. Enjoy Gym Bunny blended into almond or hemp milk. Whizz into your smoothie or add to food. Don't be afraid to add fruit, nuts, seeds and honey. Gym Bunny is a High Fibre food that helps to make you feel fuller for longer. Necessary for healthy teeth, bones, hair, skin and nails. Gym Bunny Banana & Nut Smoothie - Blend 2 teaspoons of Gym Bunny, 1 banana, 300ml cashew milk & a small handful of walnuts. Creamy post workout deliciousness!